The restaurant at Buck’s T-4 has been recognized as among the finest in Montana and the skiing community. Chef Scott Mechura brings together a unique combination of traditional local ingredients and classic culinary techniques. 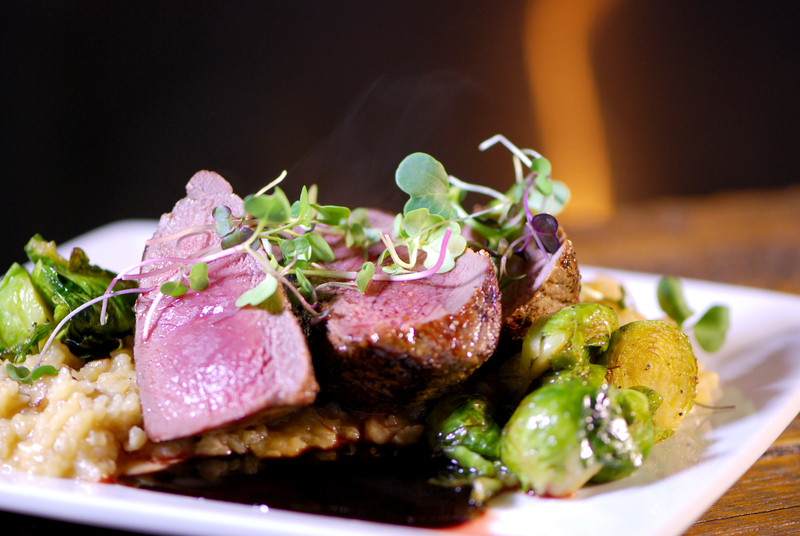 The menu features wild game, hand-cut steaks and daily specialties. Call for reservations 406-993-5222. For information on our complimentary dinner shuttle from Big Sky & Moonlight, call 406-993-5222. **PLEASE NOTE: The restaurant at Buck’s T-4 will be closed from April 7-May 24, 2019. Chef Scott Mechura brings together a unique combination of traditional local ingredients and classic culinary techniques. The menu features wild game, hand-cut steaks, two-fisted sandwiches and daily specialties. Our wine list has been the recipient of Wine Spectator’s prestigious “Award of Excellence” since 1995. With over 175 selections from dozens of wine regions around the world, you’re sure to find something to fit every taste and budget. Our banquet menus offer a wide selection of meals to fit any taste and budget and we are happy to customize a menu for a once-in-a-lifetime dining experience. We feel that just because you are taking a large group of people out to dinner doesn’t mean you should have to compromise on the food!